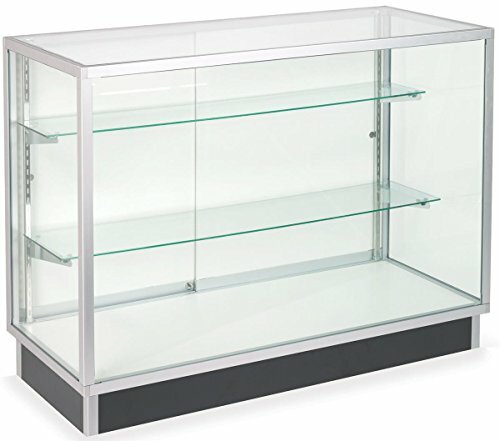 Use this versatile free-standing glass cabinet in a retail space to display a wide variety of items in various shapes and sizes. It features 2 adjustable tempered glass shelves, one 10-inch deep and one 12-inch deep. Tempered glass is a preferred material for these types of cases because it is durable and less likely to break. Framed in clear-coat aluminum, the tempered glass sides allow for a clear view of the items displayed inside. This glass cabinet has a locking sliding door and recessed black kick plate. Dimensions: Overall: 48"w x 38"h x 20"d Kick Plate: 4"h (recessed 1" from cabinet face) Weight: 156 lbs. Clear-coat aluminum frame will not distract from items displayed inside. Tempered glass construction allows for a full view of showcased merchandise. Two different sizes of adjustable height shelves make it easy to accommodate products of varying heights and sizes. Features locking, sliding glass doors for additional security.